Twelve months ago when we published the 2009 Treasury & Cash Management awards, treasurers were mostly concerned with preserving capital and reducing counterparty risk. While these concerns have not subsided, the banking landscape is perhaps a less confusing one. State backing has helped prop up some big names in the global cash management space, and other providers have taken advantage of the crisis to increase their market share substantially—particularly in Western Europe and parts of Asia. While some global cash management banks were more focused on staying in business and scaling down their global ambitions, others such as J.P. Morgan, Deutsche Bank and Standard Chartered continued to invest heavily in their treasury and cash management businesses, rolling out new functionality, particularly in the area of liquidity management. Some of those harder hit by the financial crisis also continued to invest in their cash management business. A good example is Citi, whose treasury and trade solutions division continued to perform well. The bank also maintained its high level of investment in technology, so much so that it was able to pull its new online cash management platform, CitiDirect Banking Evolution, out of the bag at the annual Sibos conference in Hong Kong last September. Cash management banks maintain that in the wake of the crisis their solutions are more relevant than ever as corporate treasurers look for ways to preserve working capital, unlock trapped capital and achieve a better rate of return across global cash pools. In addition to liquidity management and counterparty risk, another area of concern for treasurers is the ability to more accurately forecast their cash-flow needs. Long-range cash-flow forecasting has long been treasurers' bugbear, but banks are gradually responding to their cries for help by unlocking more information held within their systems to aid the reconciliation and receivables process. 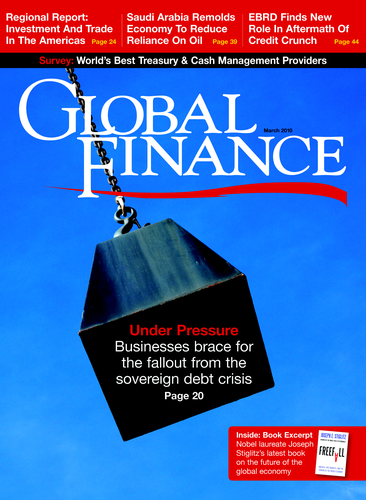 In this year's awards, Global Finance has picked the cash management banks and treasury management software and service providers we believe have successfully combined geographical reach, product innovation, investment in technology and local market knowledge to meet the increasingly sophisticated and complex regional and global needs of their customers. Winners were selected using a range of subjective and objective criteria including companies' investment in new and innovative technologies, profitability, product depth and breadth, market share and regional coverage. Our winners reflect those companies that are innovating beyond core treasury and cash management capabilities to provide real value-added solutions to their banking and corporate customers. It is no longer just about being a strong provider in a particular region but increasingly about the ability to service customers in a range of locations, each with its own regulatory requirements, market infrastructure and challenges when it comes to facilitating payments, collections and liquidity on the ground. Citi Global Transaction Services (GTS), which includes the Treasury and Trade Solutions (TTS) business line, continued to perform well despite the financial crisis. With low interest rate margins, 2009 was a challenging year in terms of revenue growth for most global transaction banks. However, Citi TTS achieved record net income in the third quarter of 2009, achieving 27% year-on-year growth. Citi TTS services more than 60,000 customers across more than 100 markets. "Our goal is to provide the access, transparency and risk mitigation required to support their current and future business needs," says Paul Simpson, global head of TTS at Citi GTS. Citi invests approximately $1 billion annually in IT, resulting in the launch last September of its next-generation online cash management platform, CitiDirect Banking Evolution. "Our ongoing investment in technology is key to our ability to deliver innovative solutions to our clients," says Simpson. "Our clients are at the center of all we do, and our product-innovation leadership is achieved via strong collaboration with our key clients and partners." Throughout the financial crisis J.P. Morgan maintained a robust balance sheet and continued to invest across all business lines to strengthen its product offering. "This investment will make it easier for our clients to move, concentrate, invest and manage their cash globally," says Melissa Moore, CEO of J.P. Morgan's Treasury Services business. According to analysts, the breadth and depth of J.P. Morgan's cash management initiatives are unrivaled in North America. In order to better serve its multinational customer base, the bank expanded its international presence and launched iDDA, a real-time-enabled platform for managing treasury activities globally. "As our clients increasingly compete in international markets, they seek a trusted banking partner that can deliver local expertise in foreign markets as well as provide support on a global scale," says Moore. The leading euro clearer is one of the banks that has benefited from the crisis as it continues to win market share, with the number of EMEA corporate cash management mandates won increasing by 84% in the 12 months to October 2009. In terms of the total number of deals won, the bank's 2009 performance exceeded 2008 by 137%. The year 2009 "was a great year for the transaction bank, with a significant increase in investments in new products and innovative solutions, which manifested itself in a strong set of results," remarks Colin Digby, head of treasury solutions and markets for EMEA at Deutsche Bank. "Deutsche Bank continues to invest more on innovation and geographic expansion into 2010 and remains fully committed to this future path of growth." The past 12 months have witnessed a steady pace of product enhancements from the bank, including its announcement of a partnership with mobile technology services provider Luup, which will see it provide mobile payment services, including e-invoicing and salary payments, in the business-to-business space. With a market presence in 20 Asian markets, in excess of 100,000 branches and a broad customer remit including multinationals, local corporates, middle-market companies, SMEs, financial institutions and government bodies, HSBC has a compelling offering across Asia. Despite slowing growth in some Asian markets in 2009 and increasing competition from both foreign and domestic banks, HSBC won more than 3,600 new regional mandates and saw its cash management business in the region grow by 30%. Despite stiff competition from its foreign peers, HSBC continues to win complex regional and global cash management mandates spanning multiple markets. These mandates focus on the provision of a wide range of services, including payments, multi-currency accounts, collections, liquidity management and enhanced automation, as well as streamlining accounts payable and accounts receivable processes. well as solutions that enable them to more efficiently manage their regional liquidity. It also champions the development of local payment and clearing infrastructures by supporting the launch of automated clearinghouses across the region. It is able to service the needs of a diversified client base in the region, which includes multinationals, subsidiaries of foreign corporations and government agencies. "Our client base in the region is extremely varied and our approach has been to work with them as a partner to deliver solutions that meet their unique challenges," says Carlos Castro, regional head of cash management, Latin America, for Citi Global Transaction Services (GTS). The year 2009 was a difficult one for any bank with significant exposure to Central and Eastern Europe. UniCredit, with total assets in the region standing at €133 billion, was able to weather the storm by keeping a watchful eye on its cost-to-income ratio. UniCredit also continued to innovate in the region in 2009, rolling out new payment, collections and liquidity management functionality to help customers reduce costs and better manage their regional cash flows. "We see innovation as the main factor in giving us a competitive edge, keeping up with the expectations of our clients and providing good services in the long run," says Ernst Ohmayer, head of cash management, UniCredit Group. "We innovate centrally and locally. Local innovation is necessary in CEE markets due to existing strong country specifics [in terms of business practice and legal systems]. In the last few years UniCredit was the first bank in several CEE countries to implement effective euro pooling." In 2009 SEB grew its total cash management revenues by 6%, with particularly strong growth in Poland (25%) and Norway (29%). Deposits grew by 13% in the same period. SEB's strength in treasury and cash management has always been its ability to devise solutions that provide corporate treasurers with greater visibility into certain aspects of their business so they can make better-informed decisions regarding working capital. "SEB is dedicated to strong client relationships so that we can respond to our clients' evolving liquidity needs and equip the business to deal with good times and bad," notes Patrik Havander, head of concept and packaging at SEB. He says that a unique element of SEB's approach is its Corporate Financial Value Chain, which helps treasurers prioritize key areas of potential added value to the company and deliver cash management enhancements with tangible and far-reaching benefits. "Effective cash and liquidity management is a vital means of ensuring that companies emerge from the downturn stronger and more competitive. Consequently, SEB's value proposition has never been more compelling," says Havander. From January to October 2009, HSBC won more than 900 cash management deals in the Middle East. It has a presence in 14 countries across the region and works closely with central banks and local regulators in the Middle East to help reduce risk in the local payments infrastructure via the introduction of real-time gross settlement systems in markets such as Egypt and Dubai. "Our history in and depth of relationships across the Middle East gives HSBC the unique ability to work closely with industries and our regulators to deliver solutions that meet the needs of our customers in a rapidly evolving cash management market," says Allan Dueck, acting head and regional head of product management, global payments and cash management, HSBC Bank Middle East. "Our customers and competitors ensure that the bar is raised each year. ...Our focus is on ensuring that HSBC continues to be the number-one choice of our customers for cash management in the region." Doing business in Africa requires a banking partner with an extensive on-the-ground presence, local market knowledge and transaction processing capabilities. Standard Bank is present in 17 African countries and has a market share in excess of 30% in key sub-Saharan African markets such as Uganda and more than 50% in Lesotho, Namibia and Swaziland. According to a South African Reserve Bank report, Standard Bank has a more than 31% market share in terms of cash management balances and transactions in South Africa. It has always been a strong proponent of electronic banking solutions that provide customers with visibility into their cash positions across the region and continues to invest in technology to the tune of more than $72 million annually. "Our differentiator and value lies in our network and the fact that we are able to negotiate favorable terms for our clients," says Dipak Patel, head of global transactional products and services, Standard Bank. "The quality of our network is key to the success of our strategy to offer an end-to-end solution. Our secure online banking platforms ensure security of funds, which must be the principal goal of any organization distributing cash in Africa." Another bank that has seen its star shine more brightly throughout the recent financial crisis is Wells Fargo, which, with the Wachovia acquisition under its belt, continues to rate highly in terms of cash management product quality and customer satisfaction. Wells Fargo and Wachovia each received 13 A+ grades for product quality in Phoenix-Hecht's 2009 Middle Market Quality Index survey of cash management customers. The Wells Fargo-Wachovia combo has increased its market share among mid-tier corporates. On the payment and collections side, the bank provides a wide range of solutions and is playing a pivotal role in helping companies make the transition from less secure and inefficient forms of payment, such as checks, to electronic forms of payment. 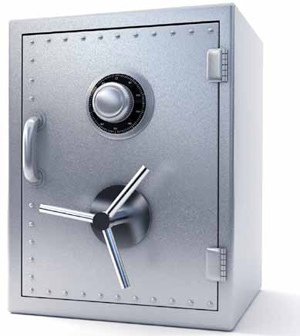 It boasts 26 wholesale and retail lockbox sites across the United States and Canada. In an effort to streamline international payments for customers, Wells Fargo established Global ACH Services, replacing wire transfers with more cost-effective ACH-type payments to approximately 40 countries. It also provides multi-currency accounts to help companies reduce the cost of foreign disbursements and collections. Deutsche Bank continues to win a number of key pan-European cash management mandates based on its cross-border payment capabilities, including the leading role it has played in rolling out its SEPA engine for credit transfers and direct debits, as well as helping other financial institutions move to the new SEPA environment. It has also expanded its payment and collections offering by ramping up Deutsche Card Services, which provides point-of-sale card payment solutions, as well as efforts to link cards with other mobile payment solutions it is developing, particularly in the global remittances space. Deutsche Bank aims to be the leading clearing bank in the online receivables space and is leveraging its Card Services in order to achieve that. It also continues to build out and expand its innovative cross-currency payments solution, FX4Cash, which simplifies cross-currency payments by enabling users to institute payments in multiple currencies from a single base currency account. Deutsche Bank has added more currencies to FX4Cash and functionality so users can better manage their receivables. One of the fundamental aspects of payments and collections is being able to provide customers with an increasing number of "touch points" in the markets in which they operate. In 2009, HSBC continued to expand touch points available to customers either by building more branches or by expanding its network of alliances with partner banks. HSBC was among the first of the global banks in the region to offer renminbi-denominated payments across key ASEAN markets. In an effort to reduce the time taken to manually process deposit tickets and checks, it has also rolled out its Remote Deposit Capture Service across nine Asian markets, which allows checks to be more quickly processed and deposited by scanning them. For those Asian companies that make regular payments to Europe, HSBC has provided an online repair tool to ensure payments are correctly formatted based on European standards. This helps reduce repair costs. Rather than a one-size-fits-all approach to rolling out cash management solutions, HSBC continues to develop tailor-made solutions for specific markets, including a new 24-hour bill payment service in Thailand and a customized check outsourcing solution in Bangladesh. In addition to the wide range of domestic and cross-border payment solutions Citi provides in all the markets in which it operates, it also develops tailor-made solutions for specific customers. A good example of that is the work it did with an Ecuadorean bank to help it compete in the remittances services space using the latest payment solution, SwiftNet Remit, from the bank-owned Brussels banking cooperative, Swift. It is also helping local institutions develop automated clearinghouses (ACHs) for electronic payments. Citi is integrated with a number of ACHs in Latin America. It is also investing in upgrading its well-known cross-border payment solution, WorldLink, to facilitate the intelligent routing of payments via the most efficient and cost-effective channels. When it comes to executing payments in the region or helping customers better manage their receivables, UniCredit has a strong physical presence and an extensive network of approximately 4,000 branches. Its goal is to become the leading provider of transaction-related services in the region. Its commitment to the payments business is demonstrated by the fact that payment services constitute approximately half of UniCredit's Transaction Banking unit's total revenues. What is most impressive is its ability to tailor solutions to meet the specific requirements of different markets. UniCredit is working with cash collection companies in various markets to enhance the safety and security of cash collections as well as facilitating the quicker receipt of funds in clients' accounts. It is also helping corporate clients in markets such as Bulgaria migrate to non-cash forms of payment such as direct debits. While the provision of automated solutions that assist companies in making domestic and cross-border payments is a cornerstone of what most treasury and cash management banks provide, to some extent a lot of what the banks offer looks the same. However, Danske Bank has gone that extra step with its collections service, which enables companies to effectively outsource the labor-intensive task of printing, addressing and sending invoices to multiple countries. All firms have to do is send a single formatted file to the bank electronically with all their collections information. In the Nordic markets Danske Bank's Collections Service encompasses e-invoices, paper invoices and direct debits, and in other European markets firms can collect money via direct debits. The bank also issues invoices on a company's behalf in a range of languages, ensuring that they contain the correct international bank account number (IBAN) and bank identifier code (BIC). HSBC is extending to customers in the Middle East the benefits of technological innovations that are tried and tested in other markets in which it operates. A good example of that is its Integrated Receivables Solution, which is extended to markets like Bahrain, Egypt, Jordan, Kuwait, Lebanon, Oman, Pakistan, Qatar and the UAE. Integrated Receivables is designed to help streamline and automate a company's availability of funds, as well as reducing the time it takes to reconcile receivables. HSBC is the sole US dollar-settlement institution for the development of a multi-currency real-time gross settlement (RTGS) payments system in the UAE. With branches throughout Africa and strong FX capabilities in 15 African currencies, Standard Bank is well placed to service corporates' and banks' payment and collection needs in the region. It has a 40% market share of South African rand clearing via the local real-time gross settlement (RTGS) system. Its extensive branch network (more than 1,000 branches within Africa) is being leveraged by other global cash management banks, which look to Standard Bank to provide in-country foreign currency and local currency multi-banking services. Standard Bank's South African hub acts as a payments gateway for multinational corporates and banks wanting to facilitate payments into other parts of the region. Working with Nile Commercial Bank, Standard Bank's Kenya subsidiary, Stanbic Bank Kenya developed a customized payment solution to ensure secure funds transfers from Kenya and Uganda to UN forces in Sudan. While some of its competitors were scaling back their investments in treasury and cash management, J.P. Morgan Treasury Services continued to invest in 2009, rolling out a new client interface called J.P. Morgan Access Liquidity Solutions to help clients better manage their global cash and liquidity. The web-based liquidity and investment portal helps multinational clients get a better handle on their liquidity and "trapped cash." In advising clients, the bank can draw on not only the expertise of its treasury operations but also its asset management business, which provides a range of global liquidity solutions in the form of money market funds. Despite scaling back some of its international businesses, particularly in Asia, RBS, which is now majority owned by the UK government, remains committed to Western Europe and has benefited greatly in terms of product depth and breadth from its acquisition of ABN AMRO's transaction banking capabilities. Nowhere is this more apparent than in the area of liquidity management, where ABN AMRO boasted a strong legacy of innovation, which has continued under RBS's ownership. RBS offers automated end-of-day "cross-regional" sweeping in 10 currencies and 19 countries. Its Cross-Border Cash Optimization (CBCO) solution achieved 100% year-on-year growth in terms of its client base in 2009. The advantage for customers is that CBCO provides them with a single overview of all their cash balances held globally and that total balance is used to calculate more favorable benefits for clients. In the wake of the recent financial crisis, liquidity management is among the most sought-after cash management solutions from banks. In the past 12 to 18 months, most of the global cash management banks have upped their game in this area, and a leading example of that is Standard Chartered Bank, which says its liquidity management cash pools grew by 68% since July 2008. Standard Chartered purports to be a leader in Asia when it comes to the provision of global notional aggregation for interest optimization. This enables customers to consolidate their balances in Asia with those from other regions to result in a more favorable interest return. It has also implemented complex cross-border multi-currency notional pooling solutions encompassing regulated currencies and markets in China, Malaysia and Thailand. At the end of September 2009, the number of clients using its global liquidity management platform increased by 15% from a base of more than 1,400. Customers of Citi have access to a wide range of regional and global liquidity management solutions, including interest optimization, cross-border sweeping and online investments. It also has a strong track record of tailoring solutions to meet the specific needs of customers. Its regional capabilities have won it various mandates to help local companies gain greater visibility and centralized control over their North American and Latin American liquidity using online banking tools. UniCredit and its partner banks provide cash pooling solutions such as zero- and target-balancing in a wide range of countries both in CEE and in Western Europe. Its cash pooling solutions can also incorporate balances held with third-party banks. UniCredit says it invests €1 million-plus annually in upgrading the technology behind its pooling services, and expanding its cash-pooling capabilities remains a key focus in 2010. In those countries where pooling structures are difficult to implement due to local regulations, the bank has developed a special form of notional pooling called margin pooling, which provides a form of cross-border interest optimization, which is particularly relevant in the existing low-interest-rate environment. It is also able to provide customers with detailed information regarding legal and tax issues in different countries, which could affect liquidity management solutions. Outside of its core Nordic markets, SEB has joined forces with ING Bank, leveraging its network to expand its global footprint, which encompasses 35 markets in Europe, North America and Asia. SEB claims to be the only bank that can move liquidity across Europe same-day, which is essential for companies with excess cash balances in multiple jurisdictions that they want to mobilize or deploy in another location. Firms can also leverage its "corporate financial value chain" product to make more-informed decisions regarding their cash and liquidity. SEB was one of the first banks to realize the importance of helping clients produce more-accurate cash forecasts and developed its Web Forecast solution back in 1997. Leveraging its expertise and on-the-ground presence in emerging markets, Standard Chartered believes it is well placed to provide companies with the market knowledge and regionally integrated solutions they need to better manage their liquidity. It provides a wide range of solutions to help firms aggregate their cash balances across multiple locations and banks to achieve a better rate of interest. It is also pioneering shariah-compliant liquidity management solutions in the Middle East. Standard Chartered claims to have more multi-currency pooling arrangements in Africa than other banks and believes its Global Notional Aggregation solution, which enables customers to aggregate balances in multiple locations and currencies for interest optimization, is a key differentiator. It has expertise in developing cross-regional multi-currency liquidity management structures for companies across Africa, Asia and the Middle East. Having developed shariah-compliant liquidity management solutions for the Middle East market, Standard Chartered is looking to extend that capability to Africa. J.P. Morgan launched a foreign exchange, payments and risk management platform for corporate clients that make inter-company and third-party payments globally. When it comes to investing excess cash balances, J.P. Morgan has helped big-name American corporates to better manage their investments by developing a rules-based automated investment solution that pre-screens bank counterparties that are used for time deposits. The banks are independently monitored by J.P. Morgan, freeing up corporate treasurers to focus on other aspects of the business. This solution, called Cash Trade Execution, proved particularly useful during the financial crisis as counterparty risk was heightened and companies reviewed their investments with particular banks. One treasurer said it helped "insulate them from the devastating levels of credit and liquidity risk that impacted the markets in 2008." Deutsche Bank's cross-currency payments solution, FX4Cash, helps reduce the time, costs and risks associated with processing multi-currency payments by enabling clients to use a single base currency account in order to initiate payments in a multitude of currencies. The bank has also enhanced DB-Direct Internet customers' ability to more securely authenticate transactions on the fly with mobile authorization capabilities. It is also working to streamline client on-boarding so customers are provided with a more globally consistent, timely and standardized means of accessing the services and solutions they require. When it comes to the provision of greater visibility and control over cash balances, liquidity and investments, Citi's TreasuryVision, with its web-based dashboard, provides customers with a multi-currency, multiple-geography and multi-bank view of their cash and investments, which is a must for treasurers looking to exert greater control and visibility over their regional and global cash positions. Citi's interest optimization service, which helps eliminate the risks treasurers face in a low-interest-rate environment, was also expanded to more markets. Citi provides automated solutions that take the risk and complexity out of doing business in multiple jurisdictions. By using online electronic banking solutions to centralize the management of bank accounts, collections and payments, Citi helps local companies achieve greater visibility and control over their working capital, enabling them to make better-informed capital deployment, investment and risk management decisions. It also provides online diagnostic tools where treasurers can benchmark their performance against their peers across a wide range of areas including risk management and liquidity. Raiffeisen International ranks among the top three banks based on balance sheet totals in eight of the 17 CEE markets in which it operates. It acts as a gateway bank for corporate customers and banks of all sizes between Central and Eastern Europe and the eurozone. Given its long history in the region, it can provide customers with the technical and legal expertise they need in order to implement cross-border pooling solutions. Its customers have praised it for overcoming challenging regulatory and legal requirements in some markets to help clients more efficiently manage their cash and liquidity. It provides a wide range of instruments for managing interest rate, currency, liquidity and commodity risks. The Swedish bank's Corporate Financial Value Chain concept enables companies to access a database of information so they can benchmark themselves against their peers when it comes to processes governing their entire financial supply chains. Companies can drill down into particular areas, including risk management, and find out how they can improve their performance compared to other companies. SEB maintains that by leveraging its Corporate Financial Value Chain, a number of clients have experienced dramatic improvements in process efficiency, liquidity and risk management. Citi's TreasuryVision solution, which provides users with a dashboard view of their cash positions across multiple banks and geographies as well as cash analytics, cash forecasting and debt management capabilities, is helping a number of companies with multiple subsidiaries to reduce their liquidity risk. When combined with other electronic banking solutions that the bank provides, companies are in a much stronger position when it comes to controlling, automating and gaining greater oversight of their payments, receivables, liquidity and investments. Discussing the control over multiple cash balances he is able to achieve using Citi's TreasuryVision solution, the financial manager of an Africa-based company says: "The ability to see our balances across 16 countries in Africa, over 200 accounts with multiple banks, by simply pressing a button is unbelievable. We can now effectively manage our counterparty exposure policies, reduce our interest expense whilst optimizing our returns." Reducing counterparty exposure, interest costs and risks is particularly pertinent in the current economic environment, and Citi provides detailed reporting on a daily basis with respect to a company's bank, currency and country exposures. Royal Bank of Scotland provides a wide range of continuous linked settlement solutions to both third- and fourth-party customers that are not members of CLS. It continues to innovate in this space, providing clients that require occasional access to larger sums of intra-day liquidity and do not hold a deposit with the bank to pay into CLS in another currency, which results in the automatic release of a "counter currency." It claims to be the only settlement provider servicing a third party in CLS's Non-Deliverable Forwards settlement service. With the acquisition of ABN AMRO's international cash management business, RBS purports to be the leader in terms of volumes processed through the Continuous Linked Settlement (CLS) Bank. It provides CLS settlement services to financial institutions, corporates and non-bank financial institutions. It is also one of only two providers to offer the full suite of CLS settlement currencies, and it continues to support the wave of new FX-related instruments that have since been added to CLS, including non-deliverable forwards. It has also created fourth-party CLS settlement services, which it says are being emulated by other banks. An early proponent of CLS from its inception, HSBC provides third-party services across all the currencies settled by CLS Bank. CLS has become increasingly relevant in the wake of the recent financial crisis, as corporates and banks look to reduce the risk of settlement failure by settling both legs of an FX transaction simultaneously. Citi's CLS platform, PayPlus, is employed as a white-label service by a number of other banks, clearing operators and other financial institutions in the Latin American region and has also been used to develop domestic FX settlement services in an effort to reduce credit risk in the local interbank FX market. With continuous linked settlement (CLS) being more relevant than ever in the wake of the recent financial crisis, Nordea is in pole position, having been one of the early proponents of CLS and being a settlement member bank and a major liquidity provider in the major Scandinavian currencies. Having been involved with the development of CLS Bank from the earliest stages, HSBC has extended its CLS settlement capabilities to a number of third-party users including those in the Middle East. It has also earned the distinction of being one of the few settlement providers that support all the CLS-eligible currencies. As a major clearer of the South African rand, which is a CLS settlement currency, Standard Bank says it has never missed a CLS payment deadline, either for itself as a settlement member or for clients for which it provides CLS services. It is also the rand nostro provider for 33 of CLS's 57 "active" settlement members. As one of the largest asset managers in the world, J.P. Morgan provides a range of triple-A-rated short-term investment solutions to help companies better manage their liquidity. It has the largest US dollar liquidity fund (for non-US investors), with more than $96 billion in assets as of September 30, 2009. It has an almost 16% share of institutional money market funds in the United States. Since July 2007 its institutional money market fund assets have increased by 154% to $348.3 billion. Money market funds are increasingly in the spotlight in the wake of the financial crisis, particularly as treasurers assess the best place to park their cash that will not only give them good returns but also act as a safe haven. Goldman Sachs' Euro Liquid Reserves Fund is triple-A-rated by the three major ratings agencies and boasts assets of almost €11 million, according to the Institutional Money Market Funds Association. Goldman Sachs provides an online cash management platform for client trading. As one of the world's largest asset managers, J.P. Morgan provides treasurers with a wide range of highly rated money market investments across a range of currencies. In terms of Asian currencies, the fund options available encompass Japanese yen, Hong Kong dollar, Chinese renminbi, Singapore dollar and Indian rupee. Brazil's second-largest private bank, Banco Bradesco posted a strong performance in 2009 despite deteriorating loan quality, as customers suffered during the financial crisis. Net income in 2009 increased by just over 5% on 2008 levels to R$8.01 billion ($4.3 billion), and total assets grew by 11.4% to R$506.22 billion at year-end 2009. In terms of its loan portfolio, the corporate segment saw strong growth in areas such as working capital management. Despite 2009's economic challenges, Raiffeisen International saw the market value of financial securities, bonds and money market products recover somewhat—particularly in central and southern Europe. Raiffeisen International provides money market instruments, interest rate derivatives and futures. Firms can choose from a range of euro and Nordic currency funds provided by Nordea. Although 2009 was a challenging year for a number of money market funds, Nordea has been able to maintain its performance. As a result, its Swedish and Danish kronor reserve funds typically achieve above-average ratings from analysts. Egypt–based Banque Misr's Youm b Youm money market fund has a widespread distribution network based on the bank's branch network, which also includes a Middle East presence—namely, Lebanon and the UAE. The bank has almost 20 branches in these two countries and is working on plans for further expansion throughout the region. The money market fund, which is the largest of its kind in Egypt, is linked to a current account. The fund has widespread appeal, particularly for those corporations with a reduced treasury function. Banque Misr's Youm b Youm money market fund is the largest fund of its kind in Egypt, with a commanding 51% market share and 23 billion Egyptian pounds ($4.2 billion) in assets under management as of November 2009. It is also linked to a money market current account. Money market funds recovered some of their value in 2009 after declining substantially in 2008. In 2009 the Youm b Youm fund grew its assets by 40% year on year and increased its client base by 30%. Corporate holdings make up approximately 45% of the fund's holdings. Bank of New York Mellon Enterprise Treasury Services purports to be the only US bank with a dedicated business devoted to private-label outsourcing. As such, it supports different forms of outsourcing, from full operations outsourcing to total treasury outsourcing. What is most impressive is the broad range of capabilities it supports, including cash management, trade, global remittances, online and electronic payment processing, international funds transfer, check clearing and lockbox. And while outsourcing in general often fails to live up to customers' expectations, BNY Mellon Enterprise Treasury Services receives consistently high customer satisfaction ratings, with 98% saying it met or exceeded their expectations. The year 2009 was a busy one for the payments software vendor, which continued to invest in its stable of payable solutions as well as acquiring Bank of America Merrill Lynch's business-to-business e-payment network, PayMode, which analysts say rounds out its order-to-pay and accounts payable offering, giving it a network of 80,000 suppliers. Supplier on-boarding is integral to any accounts payable solution, and the PayMode acquisition certainly puts Bottomline on a stronger footing to meet that challenge. Its supplier portal also enables suppliers to upload invoices and check their payment status, as well as helping buyers make the transition from paper to electronic invoices. Customers, which include global corporations and Fortune 500 companies, can also access its solutions on a software-as-a-service basis, which helps reduce the total cost of ownership. SunGard AvantGard Receivables is considered to be the most comprehensive solution in this space, providing users with a wide range of functionality to help them better manage their collections, reduce credit risk and ease dispute resolution. The solution is deployed globally, and users report substantial reductions in days sales outstanding as well as reduced dispute volumes. The EIPP space is becoming increasingly competitive, particularly as increasing attention is placed on the end-to-end order-to-cash cycle of which e-invoicing is an important component. Finland's Basware has a well-established footprint in the purchase-to-pay space, with customers in Europe, the United States and Asia-Pacific. It provides a range of solutions to facilitate the electronic exchange of documents and for achieving higher levels of invoice automation. Its Invoice Automation solution enables firms to increase the number of electronic invoices they can process. "We've cut significant time out of processing invoices. Now the payment process takes about 25 days instead of 40, and 85% of invoices are paid within seven to 10 days after they are loaded into the system," one Basware customer says. A key differentiating feature is Basware's open network approach, which enables it to interoperate with other e-invoicing suppliers (more than 60 e-invoicing operators). The open network is used by 160,000 suppliers to exchange e-invoices, and in 2009 Basware transmitted approximately 10 million native XML e-invoices. Using rules-based software, payroll managers can ensure that global human resource operations are run on schedule and tailored to suit the country-specific requirements of their global payroll, including specific compensation benefits. Instead of having to use different payroll engines for different locations, Oracle provides a single rules-based engine for companies' global payment needs. P-cards, or purchasing cards, have come into their own in the wake of the recent financial crisis as an increasing number of companies recognize the cost savings and other benefits they can gain from streamlining and controlling their card spend. One of the distinguishing features of American Express' corporate purchasing card offering is its vPayment solution, which assigns a unique account number for each buyer-initiated transaction. That not only reduces the potential for fraudulent card use but also provides issuers with a higher degree of control as the account number is only valid for a certain period of time and the amount of spend linked to that number can also be controlled. Recognizing the positive impact P-cards can have on optimizing working capital, American Express' Buyer Initiated Payments (BIP) solution enables companies to extend their days payable outstanding by enabling them to consolidate multiple regular invoices into one monthly payment. With the acquisition of e-billing presentment and payment provider CheckFree in 2007, Fiserv gained some best-of-breed technologies to round out its product offering, which includes core banking systems. Its customer base comprises financial services providers of all sizes, and it has been at the forefront of developing multi-channel solutions, including mobile banking. Fiserv provides traditional electronic payment solutions including debit, ACH, cards and online banking. In 2009 it signed more than 400 new electronic bill payment customers and more than 200 new debit clients. It has helped a number of credit institutions and banks enhance their multi-channel offering by combining online banking and e-billing solutions. Its customers include US bank Wells Fargo, which is leveraging Fiserv's ACH solutions. SunGard Availability Services has continued to invest in its UK network of data recovery centers, but what really helps it stand out from the crowd is its early adoption of cloud computing to provide infrastructure-as-a-service solutions to companies that do not wish to make the upfront investment in maintaining their own back-end infrastructure. To increase firms' confidence in cloud computing, particularly financial services firms that are worried about the security of confidential data, SunGard Availability's SunGard as a Service is based on a private cloud. This year should also see additional cloud offerings from the leading business continuity provider, including storage-as-a-service. With more than 100 clients in North America alone and a growing customer base throughout Europe and Asia, Canada-based CPAS Systems continues to enhance its pension plan administration software platform. It provides a single platform for administering defined-contribution and defined-benefit pension plans. It also boasts multi-currency, multi-jurisdictional and multi-lingual capabilities and a user-friendly web-based browser. Competition in the enterprise services space has always been heated, but according to analysts IBM remains the leader in the IT services space despite the merger between Hewlett-Packard and EDS. IBM's Global Business Services arm is considered to be the world's largest IT consultancy and makes up a significant portion of Big Blue's revenues. It provides consulting, outsourcing services, systems integration and application management solutions across a wide range of areas including supply chain and financial management and business analytics. SunGard AvantGard's treasury and risk management solutions are used by more than 1,800 customers globally. According to June 2008 figures published by Aite Group, SunGard has the largest number of treasury systems customers, with an almost 40% market share. SunGard AvantGard Treasury helps companies gain greater visibility into their cash positions and better manage their overall, cash, debt and risk positions. Its Ambit solution is geared toward financial institution customers that are seeking solutions for financial management, risk and compliance. SunGard AvantGard's solutions support complex treasury operations and can be easily integrated with other platforms for straight-through processing. With total cost of ownership of treasury management software remaining a major stumbling block for some treasurers who still use Excel spreadsheets, Wall Street Systems (WSS) was one of the first software vendors to throw its weight behind the ASP model, with its Wallstreet Treasury software-as-a-service. Wallstreet Treasury not only enables users to benefit from a wide range of treasury management functionality developed by Wall Street Systems but also allows them access to a wide range of third-party software via WSS's partner network. Customers can choose from third-party functionality such as bank account management, bank connectivity and hedge accounting. Its Wallstreet Suite treasury management software is aimed at both bank and corporate treasuries and provides a wide range of functionality supporting companies' cash management, trading, and investment and risk management activities. Last year WSS unveiled a mobile interface for Wallstreet Suite designed to help treasurers perform a range of activities including payment initiation and authorization on the go.